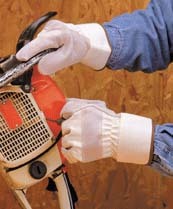 Double Leather Palm Gloves - Maintenance Products Inc. Double leather palm gloves are ideal for general maintenance. They provide double the protection of the regular leather palm gloves, a comfortable grip, and ease of movement.